Enemies are coming and they bring fire on Chapter 13 Page 14. It’s time to leave the river. 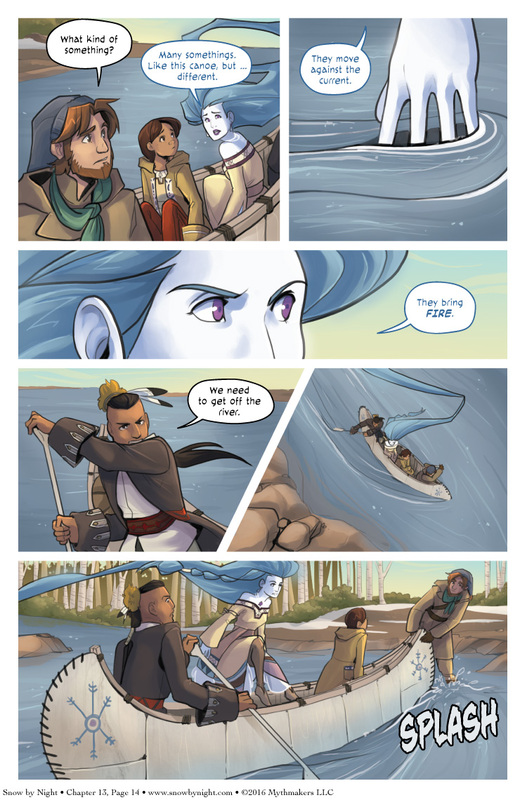 You can see one of the advantages of the birchbark canoe when you vote for Snow by Night on Top Web Comics! I have an exciting announcement to make! Snow by Night will be a sponsor of Indigenous Comic Con in November! I’m proud to be working with Lee Francis of Native Realities to make this convention a reality. It’s going to be a great gathering of native artists and their fans. I’m really looking forward to it! And get a hat or something for Snow I mean she’s got a freakin Banner going on there. See http://www.snowbynight.com/pages/ch12/v3.php for their battle plans.